Renovating a home is an expensive undertaking even when things go right. When things go wrong, unexpected costs and delays can be financially devastating. This book can help you make informed contracting decisions. Kia Ricchi, a Florida-based contractor, says there are steps homeowners can take to ensure a renovation project goes smoothly, and she outlines these steps in her book, Avoiding the Con in Construction. Ricchi, who educates homeowners about construction issues through her website The Contractress, offers advice and tips from an inside-the-industry perspective. Homeowners (or potential homebuyers) are advised to research a contractor's qualifications and character using state websites and other public records—before inviting candidates into the home, as fraud can occur when you invite strangers over, says Ricchi. 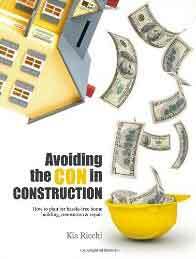 The book offers many tips on how to avoid other common pitfalls, incuding liens and jobsite injuries. Guidelines explain how to develop a "scope of work" and how to recognize proposals and contracts that are one-sided or unfair. In addition, this book explains the permitting and inspection process. Ricchi points out that whether you are planning a small repair, remodel, addition or construction of a new home, the same procedures and protective guidelines generally apply. Ricchi is a Florida-licensed building contractor. Since earning her licensure in 1998, she has completed numerous residential and commercial projects including several for the State of Florida.